I have a dog and I’m thinking of getting a cat. Do you have any advice? If your dog isn’t used to cats, start with considering the dog’s personality. Does your dog have a high prey drive? Will it try to herd the cat? Is it gentle and friendly? It’s also a good idea to brush off some doggy obedience skills. Practice sitting down, coming when called for, and a “leave it” command. When you bring your new cat home, give him or her a room of their own and time to settle in. 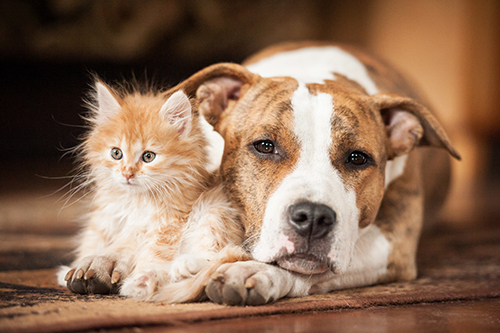 Let the process of dog and cat becoming friends take its time – once you succeed they’ll be friends for the rest of their lives and it doesn’t matter if they need a few weeks or even months to get to that point. 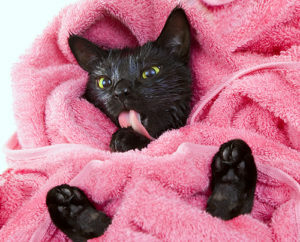 Rub your cat with a towel and let the dog smell it – and vice versa. This is a great way for them to get used to each other before the first meeting. Many problems between cats and dogs start with the dog’s need to smell everything new. Make slow introductions by the doorway to the cat’s room. Make sure you have some extra good treats available. It’s a good idea to block the door with a gate, so the cat and dog can see and smell each other, but not touch. Walk your dog past the door several times every day, and give treats and praise to both dog and cat when they are calm and ignore each other. If the dog reacts strongly to the cat, distract with obedience commands such as sit or lie down. And, when your dog manages to pay attention to this with the distraction of a cat nearby, he or she deserves treats! It’s a good idea to let the cat set the pace. If your new kitty seems curious and approaches the gate, it’s a success as far as the cat is concerned. If your kitty hides, stay at this stage until the dog is no longer a big deal. Avoid forcing the cat to meet the dog. First impressions are important to cats and can stay with them for a long time. If your cat seems unafraid and maybe even interested, you can let them meet face to face. Keep your dog with you on a loose leash and make sure the cat can retreat or hide. Praise good manners. To start with, keep the cat and dog separate when unsupervised. A little preparation goes a long way. Your dog barking at the cat or chasing the cat can cause stress and lead to other problems. Redirect the dog’s attention in a positive manner and help both animals feel the interaction is positive. Make sure your dog can’t reach the cat’s litter box – dogs have bad bathroom manners and cats don’t like their butts sniffed when using the box. Keep the cat’s food out of reach of the dog. Even if your cat is to be allowed outdoors, make sure to have the pet door locked during the initial introduction. They may dart outside and not know where they live.